Another week down and another dram closer to that Malt Mission #200 landmark. Thanks for reading. James Robertson may have been a popular kid in school, but when he grew up and got a license to distill whisky in a valley around the River Dee renowned for illicit stills and 'moonshine' production, his popularity went up in smoke... so to speak. His first distillery, Glen Feardan was built in 1823 and mysteriously burnt down three years later. His second, Lochnagar, suffered the same fate in 1841. Understandably, he abandoned the distilling business. In 1845, John Begg picked up the Lochnagar story and built New Lochnagar. In 1848 Queen Victoria and Prince Albert spent time in the area at Balmoral castle, which they bought in 1852. The Queen quite liked the whisky of her new neighbour and offered the distillery a Royal warrant. 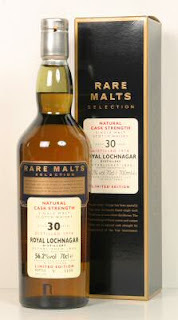 Lochnagar is one of the three distilleries allowed to use the word 'Royal' in its name. Can you name the other two? * Royal Lochnagar was the first distillery I visited in Scotland. 12,000 others do the same each year. Sherry oak, sour milk, punchy and pungent. Crabapples, sulphur, peach and cheesecake. More of the sour elements with water and a bit of melon rind. Sweetgrass, snowpeas, spice, sherry. Neal's Yard Dairy, sweetened with freshness of spring. Sulphur, walnuts, and long sweet sherry. Water mutes the already subtle tones of this one. It's a funny one. Shy. Sour and quietly angry. A refresher, I suppose it would go well with Earl Grey tea at 4pm. One for completists and explorers.